Let’s make a big assumption for a moment: All year long, you’d sidestepped the hectic life. How’s life looking now? Cramped work deadlines, family functions, last-minute mall dashes and “the holiday season” converge in a blinding whirl of stress and anxiety. Add inclement weather, the end of daylight savings and a few other negatives, and the health consequence in the overwhelming majority of cases is poor sleep. Here are some of the common culprits of December sleep issues and what you can do to avoid them. The cause: thermostatic overload. Cold weather often causes bedtime compensation in the form of thick socks, wool pajamas, and layer upon layer of blankets. All that might hit the spot when you roll into bed, but it raises the risk that you’ll struggle to stay asleep as your body temperature progressively passes the comfort zone. The solution: Warm your house to the desired temperature before bedtime – then turn the furnace off for the evening. Don’t overdress; if you get warm during the night, it’s easier to strip off a blanket than it is to remove an entire layer of clothing. The cause: excess fuel. Tossing and turning through another overstuffed night? Holiday feasting can lead to overconsumption of carbs, sugar, alcohol – all digestive challenges your body and mind don’t need to deal with throughout the night. The solution: Eat, drink and be merry this holiday season, but do so in moderation. The cause: mental clock. The 1/2 hour to an hour before you actually fall asleep is an important time. It prepares your body and mind for peaceful rest. Jump into bed after a busy day and expect to doze off for the entire night is idealistic thinking, to say the least, particularly when you’re worrying about tomorrow’s laundry list of responsibilities. The solution: Take a long bath, read a good book, or just lie in bed reviewing your day. Get all the stress out of your body – and bed – before you turn out the lights. The cause: impaired senses. 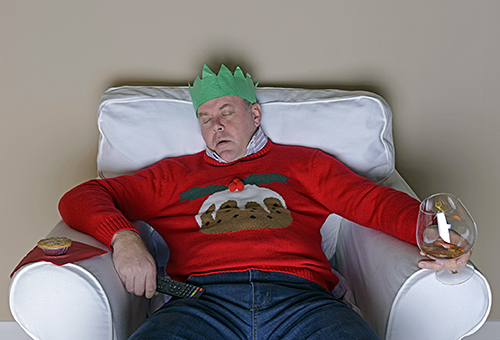 Can’t fall asleep – or stay asleep – because of a holiday noise issue? During the season of giving, many people give their neighbors too much joy – in the form of blinding, blinking holiday lights, music and festivities that persist long after you’ve turned in for the night. The solution: There’s no better time to invest in a set of earplugs and an eye mask to help you sleep through the holidays. Black out the light, silence the noise and enjoy a well-deserved night of restorative sleep.